VPAP Auto with Easy-Breathe...the next level in bilevel VPAPâ„¢ Auto is a compact bilevel device designed to deliver effective therapy as naturally and comfortably as possible. VPAP Auto combines the clinically proven AutoSetâ„¢ algorithm with the supreme comfort of Easy-Breatheâ„¢ technology. VPAPâ„¢ Auto - features and benefits quiet comfort VPAP Auto offers nearly silent therapy and greater pressure stability so patients sleep comfortably throughout the night. Easy-Breatheâ„¢ VPAP Auto uses the smooth pressure delivery of the VPAP Adapt SVâ„¢ and synchronizes with the patientâ€™s normal respiration so that breathing feels more natural and comfortable. 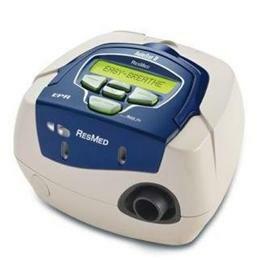 ResMedâ€™s Easy-Breathe pressure profile is more natural and comfortable than the traditional square bilevel waveform. Like natural breathing, VPAP Auto fills the lungs gradually, leaving patients relaxed. Proven technology with ResMedâ€™s clinically proven AutoSetâ„¢ algorithm, VPAP Auto is able to detect flow limitation and act preemptively to prevent apnea and snoring events. AutoSet technology controls VPAP Autoâ€™s bilevel treatment pressures with established minimum and maximum pressure limits. Modes & Compatibility Equipped with three modes (VAuto, S and CPAP), VPAP Auto is the most versatile device available and is compatible with the S8 ResLinkâ„¢, HumidAire 3iâ„¢, ResScanâ„¢, S8 ResTraxxâ„¢ and ResControl IIâ„¢.